In 1867 Simon Schwendener, a Swiss biologist, discovered that lichens are dual organisms composed of a fungus and its algal partner. Later, biologists discovered that a third organism, a cyanobacterium such as Nostoc, sometimes becomes part of the lichen, creating a three way symbiosis, as in Peltigera. Some scientists say that the fungus parasitizes the algae and others say that the association is symbiotic or mutually beneficial. 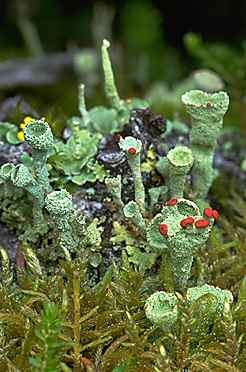 Others say that the lichen should not be called an "organism" at all because it is really an ecosystem in miniature. At any rate, lichens are some of the most adaptable organisms known and can live in deserts, tropical jungles, arctic tundra, on rocks, inside of rocks (endolithic), on bark (corticolous), on soil (terricolous), almost anywhere. Despite their adaptability, lichens generally require pure air and water to live and can be used to monitor evironmental air quality. 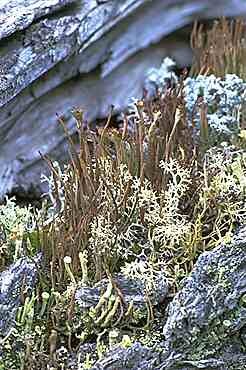 Alaska has a profusion of lichens common to the boreal forest and arctic-alpine tundra such as the various Cladonia and Cladina species shown here. To see more, click on a lichen from the list to the left.